About six weeks ago, in mid-December, I received an email from Barbara Moules in Australia, saying that she was a direct descendant of Edward Francis Roche (1828-1903), and that a letter would follow in the post. The letter arrived a few days later, together with a copy of William & Catherine's marriage certificate and an explanation of Barbara's interest. Her great-grandmother Frances Roche was a sister of Catherine, and Barbara had been researching the Roche family for some years. She had learnt, via the Alexander Turnbull Library (who had presumably found my two year old Rootsweb Mailing List post, of my interest and was intrigued to hear of the photographs in my possession. "Edward Francis Roche, his wife Dorothea and their children Mary Elizabeth, Henry, Catherine, Dorothea, John & Francis James, came from Ireland to New Zealand in 1880 ... My great grandmother, their second child Frances, had in 1878 been sent to New South Wales [with her husband Bartholomew Murphy] in disgrace because she not only became pregnant to the stable boy, but he was also a Catholic ... By the time Catherine married, her parents would have been 61 (Edward) and 63 (Dorothea)." "I give ... all moneys ... to pay the net annual income arising therefrom to my sister Frances Murphy of Sydney in the State of New South Wales, widow ..."
I forwarded images of the photos by email, while in a subsequent letter Barbara sent me a photocopy of a copied photo of Catherine's mother Dorothea from her own family collection. It was obviously the same portrait as the one I had purchased on eBay a couple of years earlier. "I will wait for the original photographs to travel through your hands again and come to rest, in a welcoming home here with me, for good ... Having the two photos will give my research a solid base and somehow place Frances and descendants firmly back with the family." "How marvellous! The photos are on the way! Will be great to receive ... Some family member must have disposed of the family photos for them to find their way onto the open market. Glad you found them." "Thank you once again and I look forward to your story. It should give a lot of researchers hope." MR. EDWARD FRANCIS ROCHE"Yesterday, at 'The Croft,' Otahuhu, Mr. Edward Francis Roche died at the ripe old age of 75 years. The deceased, who came out to the colony nearly 30 years ago from Ireland, was well known in agricultural and pastoral circles, and resided for many years in the Waikato district. On the sale of his estate in the Waikato, Mr. Roche went to live at Tauranga, where he remained for some years. Among his numerous acquaintances the deceased was highly respected as a man of sterling integrity. He leaves a grown up family, the eldest son being in the employ of the Auckland Education Board ... One of the daughters of the late Mr. Roche is the wife of Mr. W.H. Herries, member of Parliament for the Bay of Plenty electorate. The interment will be private." The moral of the story, if there is one, is that when doing family and local history research, it always pays to leave a paper trail, or an internet presence of some sort. In other words, make postings on mailing lists and online forums with details of your interests or questions. It is also wise to leave some means for a potential reader to contact you at some stage in the future, although one should take care not to reveal too many personal details. Nothing may happen for years, or it may never result in anything, but it could, as in this case, have a very happy ending. Several years ago I purchased these two cabinet card portraits on eBay, taken in the studio of John Robert Hanna at 134 Queen Street, Auckland, New Zealand. 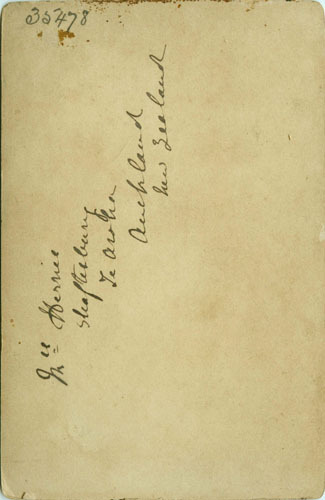 They were of an elderly man and woman, and were inscribed on the reverse, in what appears to be a contemporary hand, "Mrs Herries, Shaftesbury, Te Aroha, Auckland, New Zealand." This interested me, because the town of Te Aroha, nestled at the foot of the Kaimai Range on the eastern edge of the Waikato farming district, is not far from where I live. In fact, I can just see Mount Te Aroha (952 metres), with its TV mast, on the skyline from my front lawn. My initial research centred on the Herries family. Sir William Herbert Herries (1859-1923) of the small settlement of Shaftesbury, near Te Aroha, was a farmer, race horse breeder and politician. The entry for him in the online version of the Dictionary of New Zealand Biography shows that he was born in London, England into a wealthy middle-class family, went to Eton College and, because of an early interest in fossils and geology, studied for a natural science degree at Trinity College, Cambridge. After graduating in 1881, he emigrated to New Zealand and settled on a 900 acre property at Shaftesbury, where he farmed and "dedicat[ed] his leisure to what became a lifelong passion for horse-racing and bloodstock lines." In the 1890s he entered local, and then national politics, serving as a Member of Parliament in opposition from 1896 until 1921, with several years as a cabinet minister after Massey's party took power in 1912. He gained a well earned reputation as an inveterate purchaser of Maori lands. 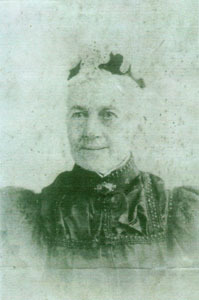 Herries married Catherine Louise Roche of Ohineroa, a neighbour's daughter, on 4 December 1889. She died in 1912 on board ship returning home from a trip to England and they had no children. "In his latter years, unhindered by the demands of farm and family, [he] was left to pursue his addiction to politics, horse-racing and alcohol." Cambridge University Alumni 1261-1900 shows that he was the eldest son and heir of a barrister Herbert Crompton Herries (1829-1870) and his wife Leonora Emma Wickham of Frimley Park, Surrey, and grandson of Major General Sir William Lewis Herries, CB, KCH, (1785-1857) of the 68th (Durham) Regiment of Foot. 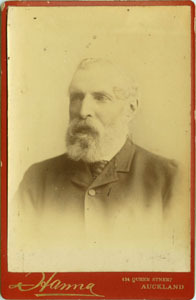 His younger brother Robert Stansfield Herries, F.R.G.S. (186-1941) of St Julian's, Kent, followed his father to the bar, was a Director of Spottiswoode's, Ltd. and President of the Geologists' Association from 1906 to 1908. The photographs of Sir William Herries included in his DNZB biography (see above) taken in the late 1890s and in 1916, respectively, don't show many similarities with the portrait by Hannah. 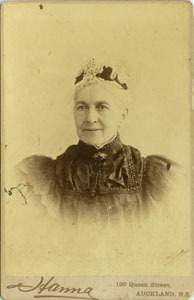 The very full sleeves worn by the elderly woman in the Hanna portrait suggest that it was taken in the 1890s, probably between 1892 and 1897. 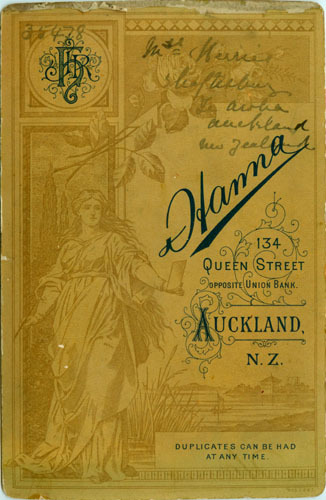 Auckland City Libraries' Photographers Database shows that Hannah operated a studio at this address from 1885 to 1895, after which he moved to 196 Queen Street. Although card mounts are of slightly different design, it seems likely that they were both taken at around the same time, and almost certainly between 1892 and 1895. "On Wednesday last Mr. W.H. Herries (who recently bought out his partner's interest in that valuable farm at Shaftesbury, until then the property of Messrs Thompson and Herries), was married to Miss Roche, daughter of Mr E.F. Roche, J.P., of Ohineroa, Shaftesbury. The wedding took place at the residence of the bride's father, Rev. F.G. Evans officiating. The event was celebrated in the quietest manner possible, as, beyond Mr Roche's family, Mis Purchas (bridesmaid), and Mr E.C. Meysey Thompson (best man), only a very few intimate friends were invited. The happy couple in the afternoon drove direct to their future home, the residence of Mr. W.H. Herries; which has been recently greatly enlarged and newly furnished in preparation for the wedding. We join with many others in wishing the newly married couple long life and much happiness and prosperity." "The Brisbane CDV and the two Auckland, N.Z. cabinet cards survived the journey unscathed. Thank you!! These are my first New Zealand cards, and are appreciated as much because they offer a slight glimpse into the past in a distant and interesting location, as they are because they seem to be so scarce and difficult to obtain." That was almost two years ago. Go to Part 2. Cambridge University Alumni, 1261-1900. Provo, UT, USA: The Generations Network, Inc., 1999. Original data: Venn, J. A., comp.. Alumni Cantabrigienses. London, England: Cambridge University Press, 1922-1954. Database of New Zealand Photographers, from Auckland City Libraries. Te Aroha & Ohinemuri News & Upper Thames Advocate, Saturday 7 December 1889, page 2, on Papers Past, National Library of New Zealand.